There are many great construction adhesives available that make a great and long-lasting installation but we do caution you to know which adhesive is best to use in your situation. 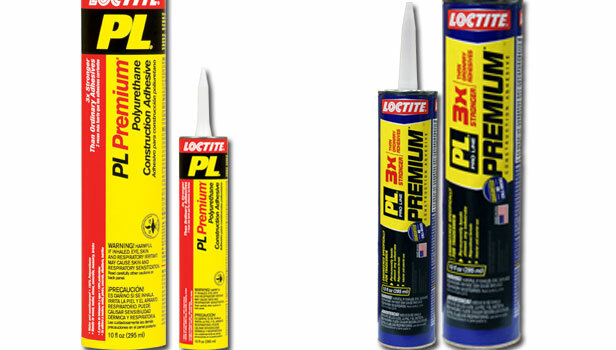 PL® Premium is our only recommended adhesive. Installing our products with ANY adhesive other than PL Premium will void the warranty and the products will not eligible for exchange or refund should any cupping or moisture related issues occur. Water based, or low VOC adhesives substitute water for solvent in the adhesive and the excess moisture will cause your treads to severely warp and buckle. If you use these ultra low VOC adhesives, you will almost certainly have warping and cupping issues causing you to have to replace your installation. This type of complaint is typically not covered by the adhesive manufacturer's nor our warranty. We no longer recommend using Liquid Nails® brand products. Because Liquid Nails' products are labeled very similarly and packaging can vary between location and retailer, we strongly discourage the use of any other brand of adhesive, including Liquid Nails, for your stair installation. Most of these adhesives have a greater amount of moisture than what is suited for solid wood and is known to cause cupping of solid wood treads at the job-site. Changes in Liquid Nails' product packaging and labeling, combined with local retailer's adhesive offering, have made the low moisture content adhesive from Liquid Nails increasingly more difficult to source. Having very similarly labeled products could easily lead to incorrect adhesive selection with serious consequences, including complete product failure or worse.